The Internet Scout staff takes pride in providing links to some of the best online resources in our weekly Scout Report. Although all of the resources we cover are valuable, inevitably some stand out from the pack. Each May, we collaborate to compile an annual "Best of" issue in order to share some of our favorite resources from the past academic year. Creating this list is never easy as the interest of our staff varies as much as our readers. We selected these ten sites based on a variety of criteria, including design, content, and creativity. As always, we also considered the websites that were most popular with our readers. We hope you enjoy this list and take a few minutes to revisit some of our favorite sites from 2017-2018. As always, we look forward to providing new batches of fantastic resources throughout the upcoming year. 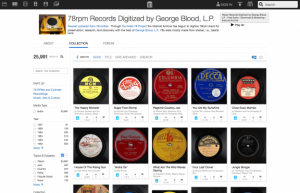 Internet Archive: 78rpm Records Digitized by George Blood, L.P.
For the past several years, a number of innovative filmmakers have been using online media to create documentary projects that invite viewer interaction. We featured a handful of such interactive, online documentary film projects over this past year. One of our favorite projects was The World in Ten Blocks by Marc Sepra Francoeur and Robinder Uppal - a film that invites visitors from around the world to experience a vibrant Toronto neighborhood and get to know a few of the remarkable individuals who make up this community. 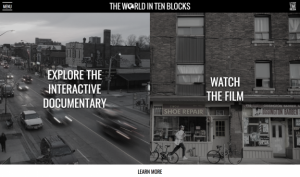 Released in 2015, The World in Ten Blocks is the title of both an interactive, online documentary and a film dedicated to a single ten-block stretch of Bloor Street in Toronto, Ontario, Canada. The project was created by filmmakers Marc Serpa Francoeur and Robinder Uppal of Lost Time Media and is presented in partnership with The Globe and Mail. Why did the pair choose to focus on this single area (known as Bloorcourt) in Toronto? As this website notes, Bloorcourt is one of the most multicultural neighborhoods in the capital of Ontario. In the interactive documentary that is available on the homepage of the site, visitors are invited to take a virtual tour of Bloorcourt (complete with 360-degree cameras and captions about the history of significant buildings) and "meet" ten business owners in Bloorcourt through a series of powerful story maps. Each of these story maps incorporates photographs and filmed interviews. Through these interviews, viewers meet a variety of people who immigrated to Toronto and became entrepreneurs, lending to the diverse and pluralistic character that defines the city. The Cooper Hewitt Museum is home to a delightfully eclectic collection, which includes textiles, furniture, graphic prints, and much more. 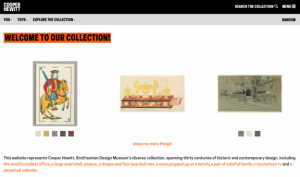 As if the contents of the design museum's massive digital collection were not enticing enough on their own, the Cooper Hewitt has created this website that allows visitors to explore this collection in a number of interesting - and sometimes whimsical - ways. In addition, we love the impressive volume of this collection: as of this May 2018 write-up, the Cooper Hewitt's digital collection contains over 200,000 items. Warning - this site is seriously fun! The Cooper Hewitt has placed digital representations of its "diverse collection spanning thirty centuries of historic and contemporary design" on its website and there are some interesting ways to search. For starters, it's possible to search by color. This is because digital images showing collection objects have been cataloged by color, assigned by automated scanning that "averages" an object's colors. The resulting averaged colors are in turn mapped to the system of specifying color by alphanumeric codes that's used in web design, thus creating searchable colors for the collection. For example, clicking the swatch labeled Firebrick, hexcode #b22222, retrieves 318 objects such as a playing card, the 7 of hearts; a Fiestaware teacup dating from 1936; a 1973 political poster, "Down with the Chilean Dictatorship"; or a mid-twentieth century Italian glass bowl with deep red stripes. Other ways to search include by country, department, people, or within publications. There's also a search by highlights of the collection: architect's eye, designs for automobiles, designs for interiors, psychedelic posters, and more. Keyword searches are also possible - try Eames. Many of our favorite websites at The Scout Report are created by museums. One exemplar is Jewish Warsaw: a three-part multimedia exhibit designed by the POLIN Museum of the History of Polish Jews. Jewish Warsaw is expertly designed, inviting visitors to explore powerful archival materials through interactive timelines, maps, and nine original comic strips created by Monika Powalisz and Jacek Michalski. From the POLIN Museum of the History of Polish Jews comes Jewish Warsaw - a powerful online exhibit that allows visitors around the world to learn about the history of Warsaw through the eyes of historical and contemporary Jewish individuals. This three-part project utilizes Google Maps, archival material from the POLIN Museum, and original comics. In the first part, visitors learn about the life and work of Janusz Korczak via an interactive timeline and historic map of Warsaw that allows users to visit important sites in Korczak's life. Tragically, Korczak, who founded a children's magazine and directed an orphanage, was murdered at Treblinka extermination camp in 1942. Next, in Stories and sketches, visitors can explore original comics, authored by Monika Powalisz and drawn by Jacek Michalski, that tell the stories of nine individuals "who greatly influenced the social and cultural life" of Warsaw. By clicking on a series of links embedded in the comics, visitors can view related materials and learn more. Finally, Past and present reveals three virtual tours of Warsaw: Common History: 1414-1939, Holocaust: 1939-1945, and Our Varshe: 1945-2016. Historical documents, sketches, photographs, and video clips are incorporated into the tours. We were impressed by Map of Life because the project offers valuable resources for researchers while also hosting a number of resources that will broadly appeal to anyone interested in plant and animal life. For example, one highlight of MOL is the color-coded species richness map, which allows visitors to learn about the relative biodiversity of particular kinds of vertebrates, invertebrates, and plants around the globe. The Map species section is another highlight, as it contains information about thousands of species around the world. We recommend the "pick a random species" option for readers not sure of where to begin. 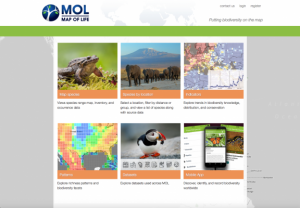 Map of Life, a non-profit organization founded in 2012 by Yale University and the University of Florida, allows visitors to explore data about the relationships between biodiversity and geography through a series of highly-engaging and informative interactive maps. Headed by Yale University ecology and evolutionary biology professor Walter Jetz, the Map of Life is the work of a large team of scientists and software engineers from Yale, the University of Florida, and other educational institutions. 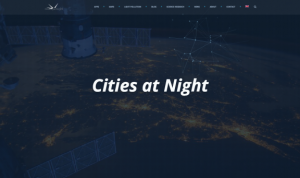 The project utilizes biodiversity data from a variety of sources, including the Global Biodiversity Information Facility (GBIF), the International Union for the Conservation of Nature (IUCN), and the World Wildlife Fund (WWF). Users can explore this data in four different ways. In the map species section, visitors can view maps that outline where they can expect to find a specific species around the world. The species by location section allows visitors to explore species data by country. Finally, the indicators section (as of this write-up, in beta) allow visitors to examine current coverage (and gaps in coverage) of biodiversity data and to compare species diversity around the world. Researchers who are interested in viewing the original datasets may do so via the datasets section. Map of Life also recently launched a mobile app, which visitors can learn more about on this website. We dedicated our Fall 2017 special issue of The Scout Report to the topic of banned and challenged books, in honor of the American Library Association's 35th annual Banned Books Week. Our special issue was a reader favorite on social media and no website was more popular than the fabulous blog We Need Diverse Books. Why did we feature this resource in our Banned Books Week issue? As writer Malinda Lo noted in 2014, books that feature diverse characters and tackle issues such as disability, racism, and sexuality are more likely to be challenged than other fiction titles. We Need Diverse Books offers a wonderful way for readers to learn about new books for teen readers that address these issues. In 2014, young adult fiction writer Malinda Lo penned an essay called "Book Challenges Suppress Diversity." Drawing on the ALA's annual list of the most frequently challenged books, Lo demonstrated that "over half of the Top 100 Banned/Challenged Books from 2000-2009 addressed issues about race, sexuality and/or disability; or were about non-white, LGBTQ and/or disabled characters." We Need Diverse Books, part of the Banned Books Week Coalition, is a grassroots organization that aims to promote diversity and representation in young adult literature. The group defines diversity as "including (but not limited to) LGBTQIA, people of color, gender diversity, people with disabilities, and ethnic, cultural, and religious minorities." 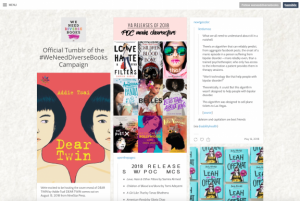 The organization's tumblr, which collects articles and reviews from around the web, provides an excellent way for readers, educators, librarians, youth workers, and caretakers to find books that are by diverse authors or feature diverse characters and topics. Recent posts include a profile of author Linda Sue Park for Kirkus Reviews; a story about the the first ever Well-Read Black Girl Festival that originally appeared in Electric Lit; and a story from Indian Country Today about Kinsale Hueston, a Navajo high school student who was recently named one of five National Student Poets. We featured this fabulous collection of digitized 78rpm records in August 2017, shortly after the Internet Archive released this collection. Since then, this collection has grown to include over 60,000 recordings. We love this collection not only because it is a delight to browse, but also because it documents a number of important movements in twentieth-century music history including early girl groups, calypso, gospel, folk, blues, and much, much more. Folks interested in staying abreast about new additions to this collection may want to follow the 78rpm Collection on Twitter: username @great78project. The Internet Archive recently unveiled this digitized collection of over 25,000 recordings from 78rpm records. First introduced in 1898, 78 revolutions per minute (rpm) records were especially popular between 1920 and the late 1950s and continued to be produced as late as the 1970s. This collection provides a glimpse into a range of music produced throughout the twentieth century, including big band music, polka, gospel, country western, blues, novelty tunes, and much more. Visitors are invited to browse this collection by year (the earliest two records in this collection are George P. Watson's "Sleep Baby Sleep" and "Medley of Emmett's Yodels" from the year 1902), topics & subjects, collection, creator, or language. This collection includes both well-remembered classics by artists such as Bing Crosby, Count Basie, and Judy Garland, as well as a number of more obscure records. There are also a few non-musical recordings, such as Yiddish language lessons and President Franklin Delano Roosevelt addressing Congress in 1942. Many of our most popular resources last year were blogs and podcasts designed to help book-lovers find new titles and authors of interests. Of these resources, Five Books stood out from the pack. We were impressed by the sheer breadth of this resource, which provides book recommendations for genres ranging from contemporary fiction to philosophy, to neuroscience, to children's picture books. In addition, we love Five Books because of the sheer number of voices it brings to the table through interviews with a broad range of writers, scholars, and other experts. Finally, this blog is easy (and delightful) to browse, allowing readers to explore books by subject tags like baking & desserts, personality, and childhood favorites. What are the five best books to read if you want to learn more about Henry VIII? Which five books exemplify the best of comic writing? What about the five best contemporary Scandinavian novels? 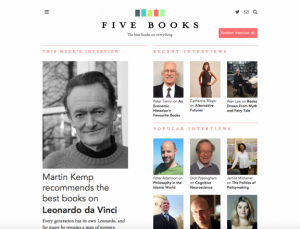 Five Books has a simple premise: "We ask experts to recommend the best five books in their subject and explain their selection in an interview." The project is based in London and features a U.S. editor; thus, most (but not all) interview participants hail from these countries. Interviewees include authors, academics, entertainers, and public intellectuals. New interviews are released twice a week. Visitors can check out the latest and most recent interviews on the site's homepage and browse previous interviews by subject tags. While those looking for a new read or hoping to brush up on a particular subject or genre may be most attracted to the lists on this page, the interviews also offer an opportunity for readers to learn more about a variety of writers and thinkers. 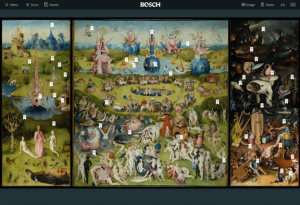 One of the most innovative websites we reviewed this year was this interactive tour of Jheroniumus Bosch's The Garden of Earthly Delights. This website allows viewers to learn more about the religious and historical context of the fascinating painting and offers some possible interpretations behind its many surrealist symbols. In addition, the added sound effects, along with the ability to zoom in and out of particular images, enhances the experience of viewing this singular work. Jheronimus (Hieronymus) Bosch's The Garden of Earthly Delights is an intricate and somewhat cryptic triptych painting that the Dutch artist created sometime in the late fifteenth or early sixteenth century. Pieter van Huystee of the Dutch public-service broadcaster NTR directed this informative and fascinating interactive tour of this painting. Visitors may want to start by taking the Highlight tour, which outlines major events, items, and themes portrayed in the painting via 15 short audio documentaries (also available as a transcript). Alternatively, visitors can select what sections of this painting to explore through the freely explore option. These audio documentaries combine analysis of The Garden of Earthly Delights with historical information about Bosch's personal life and about fifteenth and sixteenth-century Europe. In addition, visitors will want to check out the extra story links as they explore this painting in order to gain even more insight about Bosch and this enigmatic work. Of all the network tools we featured in the past year, Library Extension stood out as the clear reader favorite. We're also fans of this simple chrome extension that makes it easy to find and request books at your local public library. Best of all, Library Extension is continuing to grow, allowing readers to find books at libraries across the United States, Canada, and Australia. Library Extension also makes it easy for users to request new or additional libraries. Library Extension detects when you're viewing a book or ebook on a site like Amazon or Goodreads and adds a box showing the availability of that item in your local library. If you have access to more than one local library, it is able to check all of them. When an item is available from your library, Library Extension will also include a link allowing you to reserve it. Library Extension currently integrates with over 4,000 local libraries. Users can request support for additional libraries with a simple contact form. Users do not need to register for any additional accounts to use Library Extension. 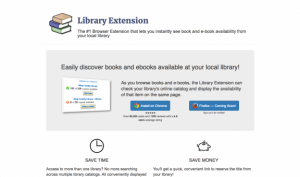 Currently, Library Extension is available for Google Chrome. A version for Mozilla Firefox is under development.